Two billion people use Facebook to connect with their loved ones every month and to be aware of what’s happening around the world. Facebook has replaced conventional communication tools which has truly helped the world turn into a global village. With 1.2 billion daily active users, Facebook is a marketing heaven for both sellers and buyers. Whether you want to find new customers or build a lasting relationship with your existing ones, marketing on Facebook ensures that you achieve your goals through several platforms integrated into one. 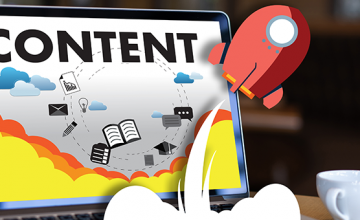 With new options such as ‘Messenger Ads’ and ‘Audience Network’, increasing the global reach of your content has become more possible and the same goes for the reach of your Facebook ads. 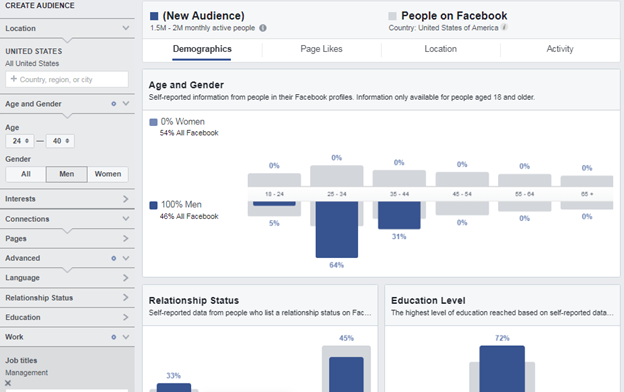 Facebook ads platform provides valuable insights and business impact. Optimizing your ads to understand the steps that people take from the moment they see your ads on Facebook leading up to the conversion is vital to every advertiser. On the contrary, the insights also help understanding the shift in the brand opinion as after the consumer sees the ads. Facebook is a major player when it comes to the media buying on mobile. 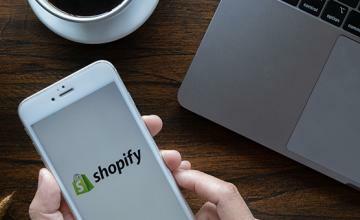 With seamless integration with top shopping platforms like Shopify, it makes it a heaven for the advertisers. Also, because Facebook holds a huge portion of the world’s online audience. 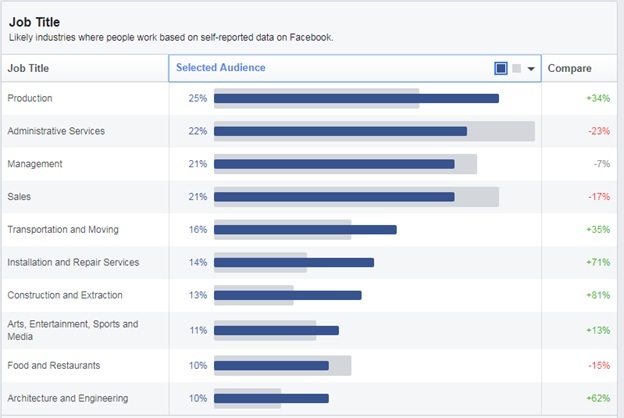 When talking about audience, we have to keep in mind a few things about audience selection while creating Facebook ads. 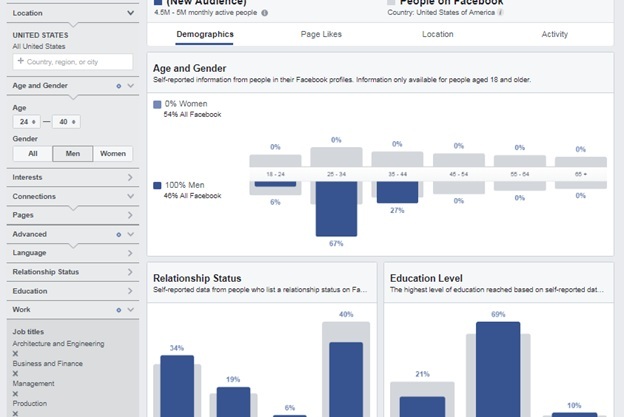 In Facebook ads or business manager, there’s a very powerful tool to do complete audience research called ‘Audience Insights’. Let’s take a look into Audience Insights before we divulge further into things to keep in mind while creating audiences. This helps in creating content that would resonate with the audience that the advertiser is targeting. It also helps in finding the people who are similar to your current audience and would flawlessly integrate with your brand. Audience Insights provides you with three major breakdowns. Audience Insights Tool gives you information about the age, gender, education levels, job titles, relationship status and more. This helps in determining the right kind of audience that would resonate with the brand. The tool also provides information about the people’s hobbies and interests. For example: we’re marketing a brand that sells T-shirts for Dog Owners. Audience Insights Tool would provide information about people who like ‘Dogs’ or ‘Dog Owners’. It would also help us connect to the people who are interested in groups or pages that connect Dog Owners. Audience Insights produces a mixture of location and relationship status to provide you with the group of people that might be interested in your brand. Let’s take an example of a business that produces Leather Shoes for Men and ships them country-wide in USA. Below are the screens for the research for this audience. We will take this example for telling you the importance of having different audience for different ad sets. So, let’s get down to the audience research for this brand. Up until now, we know two things for sure in the audience demographics. The location and the gender. We set the location to USA and selected the gender as ‘Male’ from any age above eighteen. The Audience Insights Tool gives us estimated 90-100 million users that fall into this category. Let’s take a further look at their behaviors. A whopping 34% of the users are single and 61% of the users have been to college. 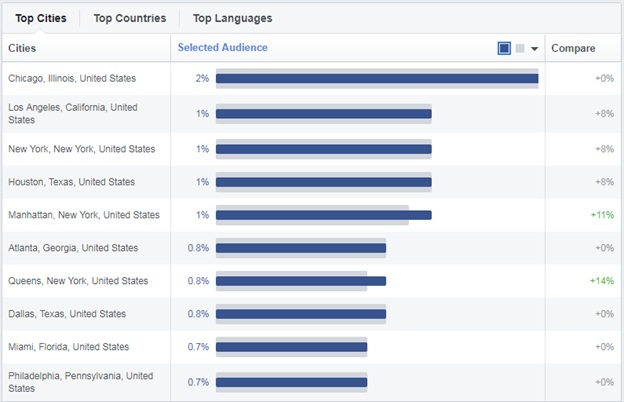 This is certainly not our defined target audience but we’re just taking it as an example to find out how powerful the Audience Insights Tool can be. A huge chunk of our audience is from production and management industry. Let’s take a look at their locations and interests. 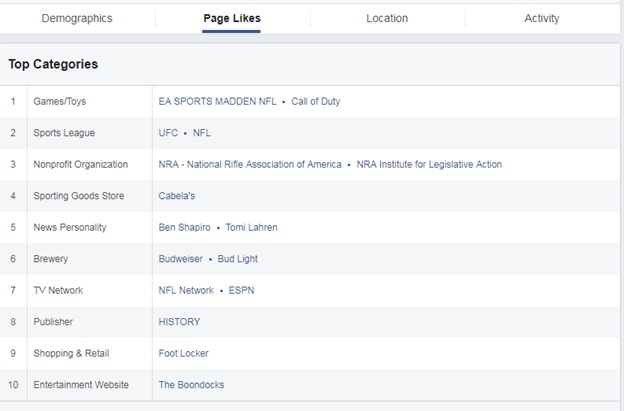 These are the pages that are liked by our current selection of Audience that mostly consist of the news, entertainment and sports industries. A quick look at this data tells us that most of our audience is from urban areas and is interested in news, entertainment and sports. However, we’re trying to market Leather Shoe products for men, that are priced at an average of $50, and have to keep other factors in mind. For example, the ages 18-23 have a lower buying power than men 24-40. The reason being a vast majority of 18-23 year olds are still in their universities and do not have the buying power as compared to the age bracket of 24-40, who are most graduated men with jobs or businesses. 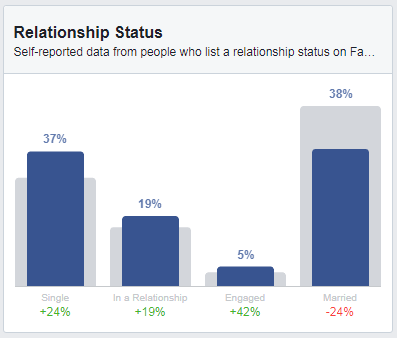 When we tinker with our audience to an age of 24-40, we see that a total of 38% users are married. Every ad-set is not compatible with every age group. Taking the product that we’re marketing, this would be more suitable to the age group that is more likely to be earning and to be able to spend their money. On the other hand, if we are marketing sneakers, the product is more likely to be popular with a different age group more likely to be between the ages of 18-25. While we keep the same Shoe Company in mind, we take two different products. Product A is trendy loafers that are for semi-formal use and Product B is for formal use. For Product A would be for people who would be interested in ‘slip on shoes’ or ‘loafers’. Product B would be for people who are interested in ‘Formal wear’ and ‘boots’. When we apply these filters for Product A, we get around 150-200,000 people. For Product B, we get the following audience. This clearly shows that for different ad-sets we do need different audience that resonates with the ad-sets. There are 10-15million people who are interested in ‘shoes’ and ‘boot’ that could go well with our Product B.
We’ve seen Product A that is priced at $30 and Product B that is priced at $60. Considering our demographics, the people who can afford to spend $30 on a product would differ from people who can spend $60 on a product. Similarly, their job titles and earning potentials would also differ. This changes the spending potentials of the users as well. So for Product B, we filter the audience out further with people who are working as ‘management’ of different corporations. We get a highly defined audience of 1.5-2 million people. For product A, we would have a broader audience that could afford to spend $30 as well as the audience that has a higher spending potential. We get a slight broader audience for 4.5-5 million people. Making it more likely for the product to resonate with the audience. The shopping behavior of your audience is important as far as marketing your product and brand goes. You’d like to engage people who have shopped online in the past. Facebook gives an option to target the audience that has engaged in online shopping or made a purchase from Facebook/partner websites. These shoppers are more likely to convert into a sale as the result of the ad campaign. Let’s assume that we’re trying to achieve sales for Product A and outreach for Product B. For Product A, you’d like to target the people who have are interested in online shopping or have made a purchase in recent past. For Product B, you would not specifically want these people to be a part of your audience as you are looking for the product to be seen by as many people as possible. 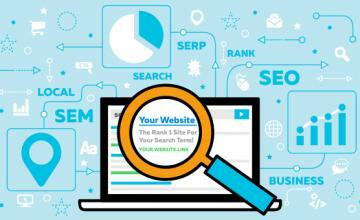 Testing your ad-sets with multiple demographics and audiences is the key to finding a winning campaign. Facebook ad creation tool gives you the option to split tests for any ad set. Pitting the ad-sets against each other would result in getting a winner and the ad-set that gets the best response with the lowest costs. If you’re creating an ad using ad creation tool, you would see the option to split test right after you select your objective. In this case, we’ve selected engagement or PPE as our desired objective for the campaign. For more information on split testing, keep reading our blog!